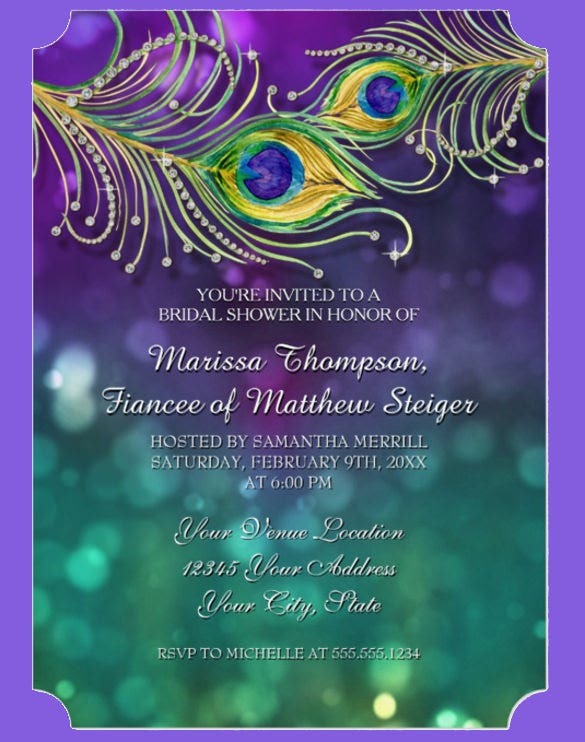 23+ Peacock Wedding Invitation Templates – Free Sample, Example Format Download! 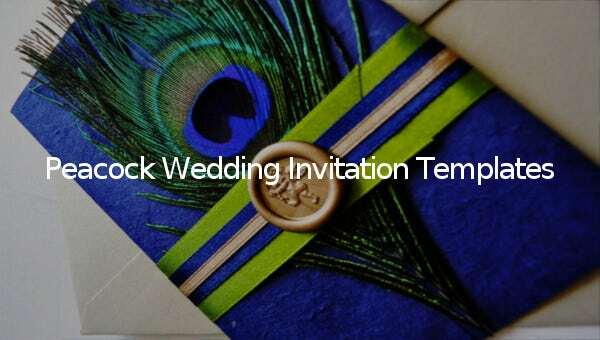 Peacock feathers are always considered as sacred sign and are mostly used for marriages or any other rituals of great importance to the lives of an individual. 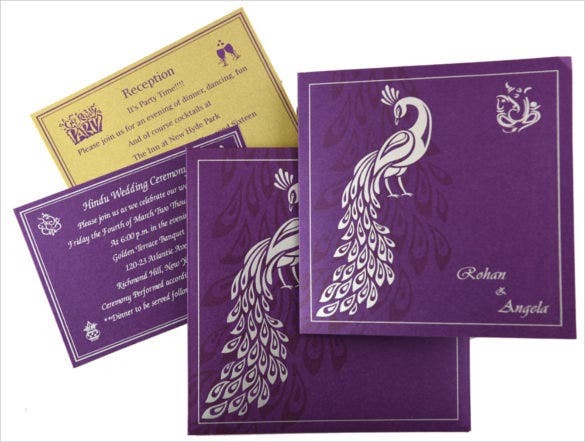 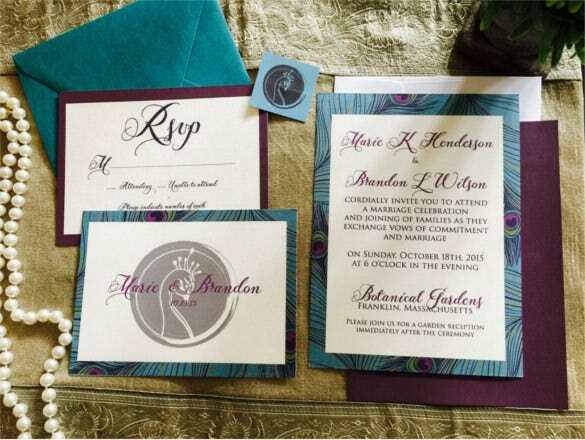 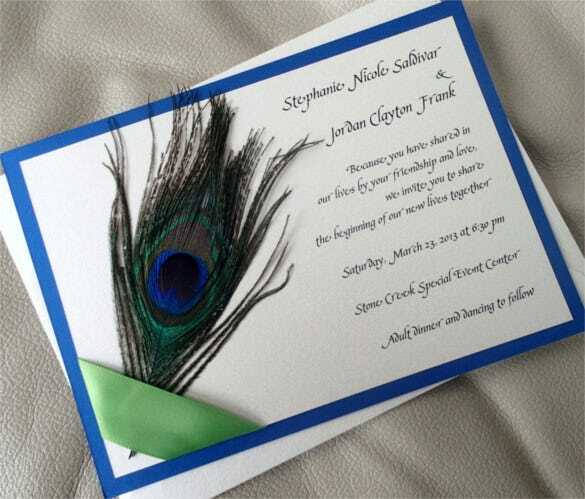 A majority of the wedding invitation cards do have peacock feathers as an icon which not only enhances and improves the beautification of the invitation template but also makes sure that the invitation looks pure and spiritual. 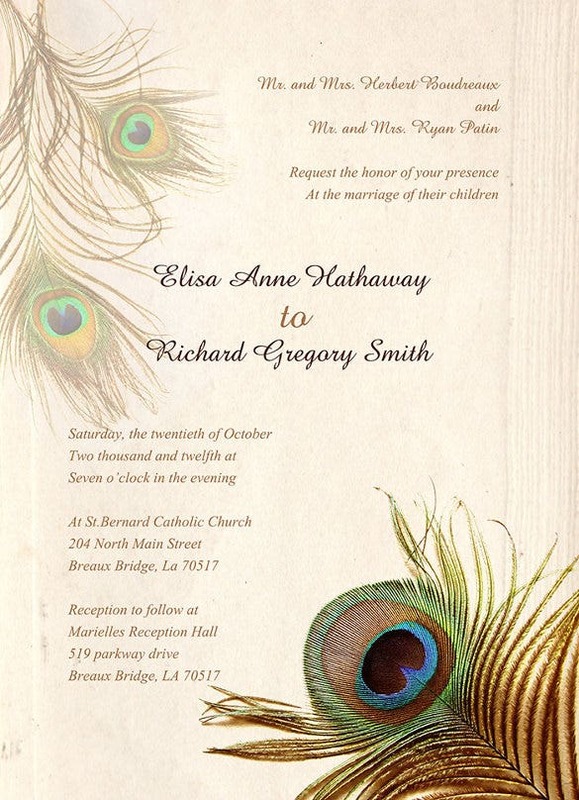 See this for more vintage wedding invitation. 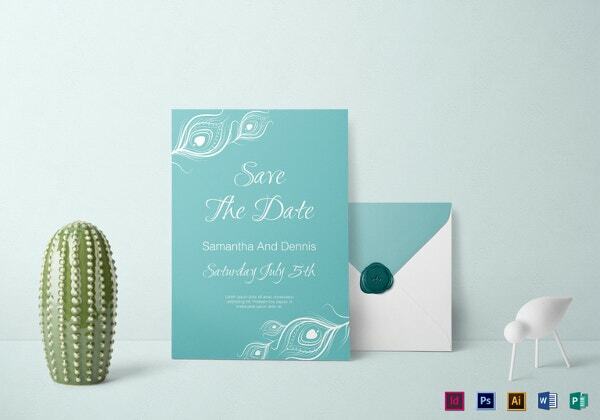 These wedding invitations template are mostly designed in the form of PSD images with a relatively light background so as to ensure that the peacock feather is prominent which in turn adds on to the beauty of the template. 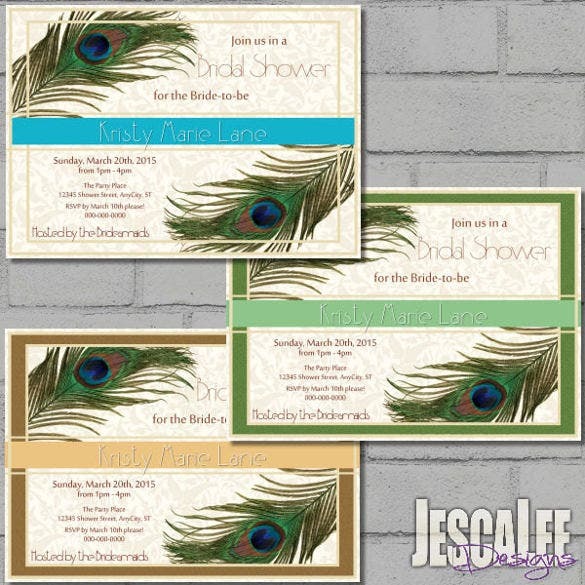 Peacock feathers look beautiful and elegant. 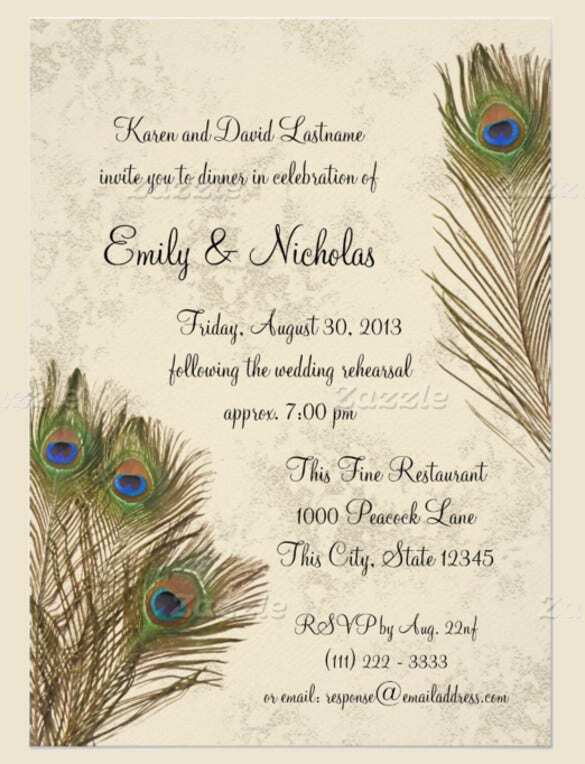 Use this beauty and elegance on your wedding card invitation with the unique feather peacock invitation theme and invite your guests in style. 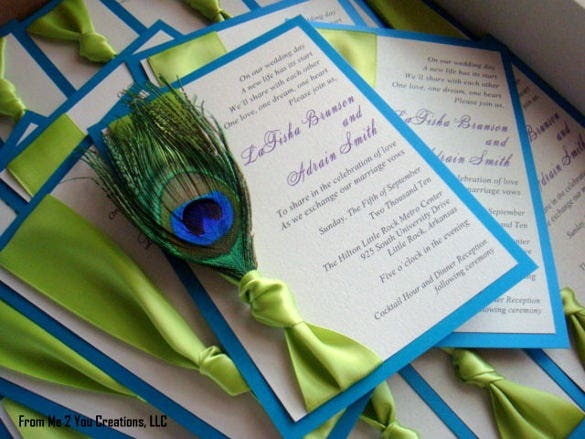 The emerald green of peacock feathers is one of the richest colours. 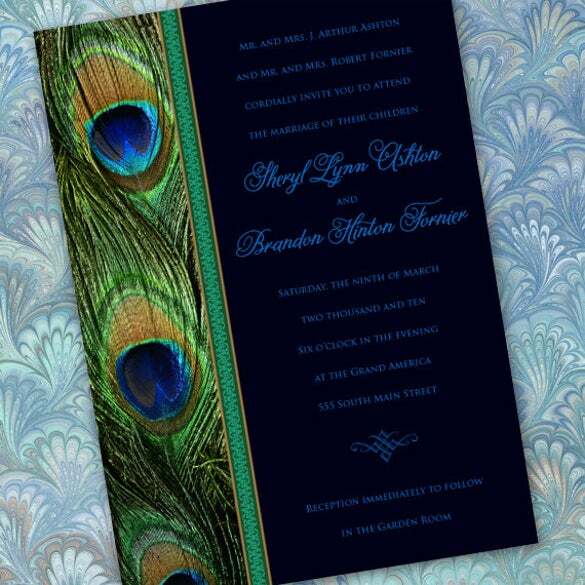 If your wedding is going to be a rich and grand affair, use this colour with a theme of peacock feathers about it. 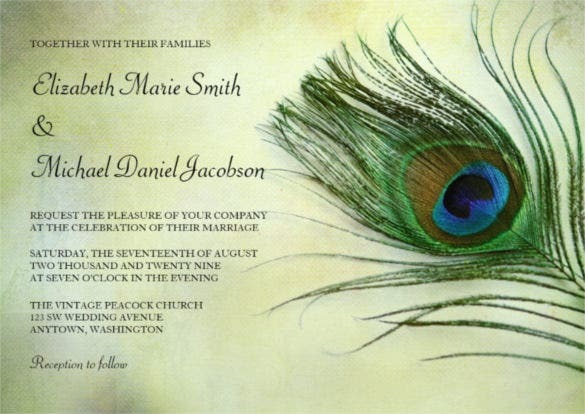 And we are sure the emerald peacock wedding invitation will always stay in the minds of your invitees. 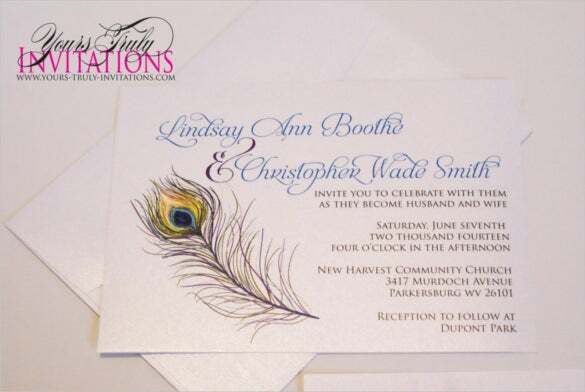 Use elegant peacock feathers to beautify your wedding invitation card. 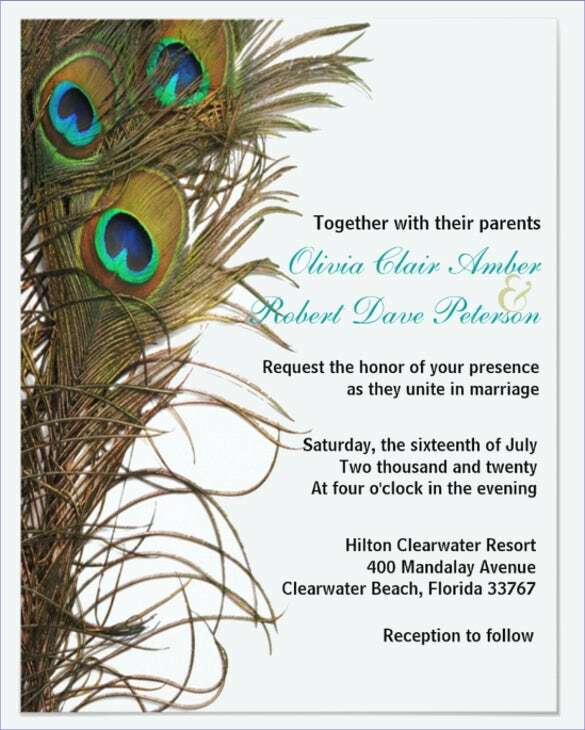 Call on your family and friends to join you and celebrate your big day in unbridled joy with this theme. 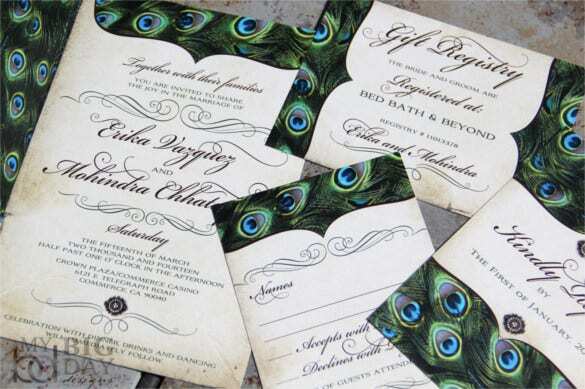 The vintage look of a paper and a peacock feather on it look very pleasant and rusty at the same time. 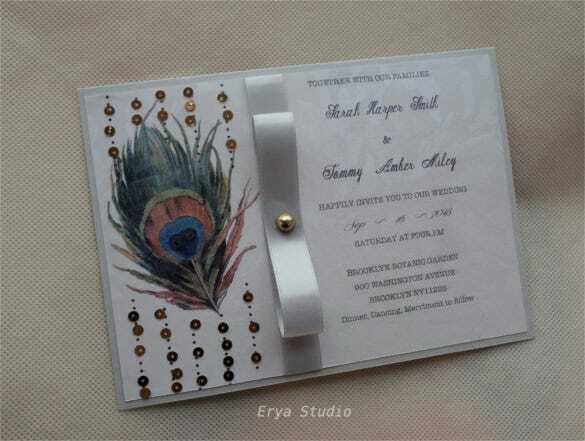 This look is one of the best looks for a wedding invitation card and looks all the more elegant. 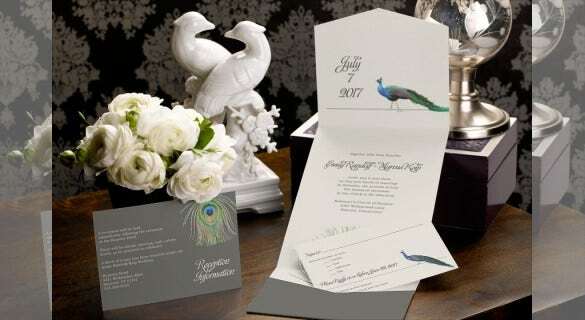 If you want to tone down the extravagance and flamboyance of your wedding invitation, use this simple peacock wedding invitation theme that looks beautiful and graceful thus making your invitation card simple yet special. 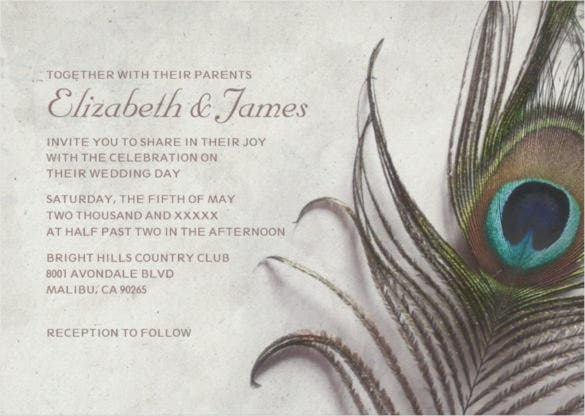 In the pink hue of love and romance, write down your wedding invitation for your family and friends and ask them to join the celebrations in a very enchanting manner. 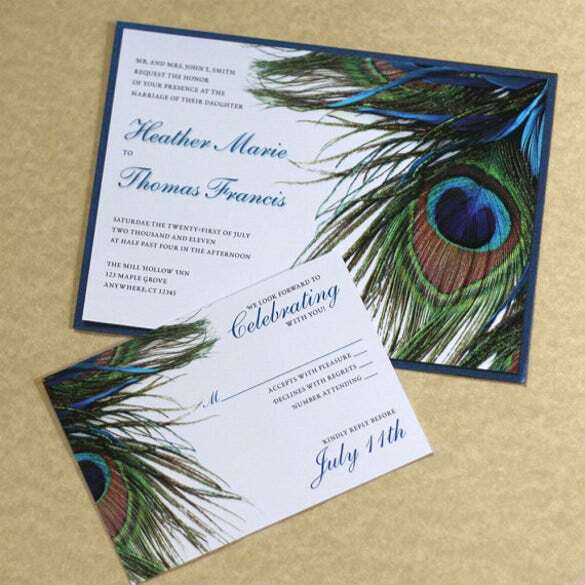 Peacock feathers have a hauntingly beautiful charm about them. 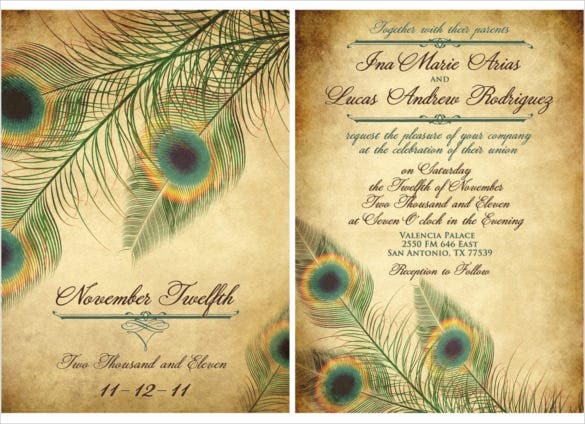 Use this very charm to ask your friends and family to join you in your auspicious wedding ceremony with the help of this rustic peacock feather wedding invitation. 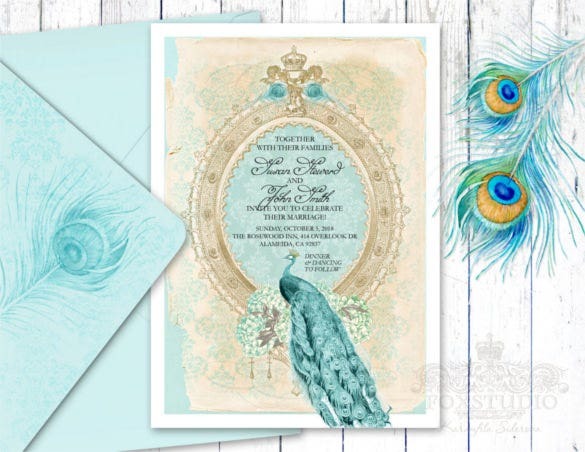 The peacock wedding printable invitation features a beautiful, full grown peacock in a light blue background and looks very beautiful. 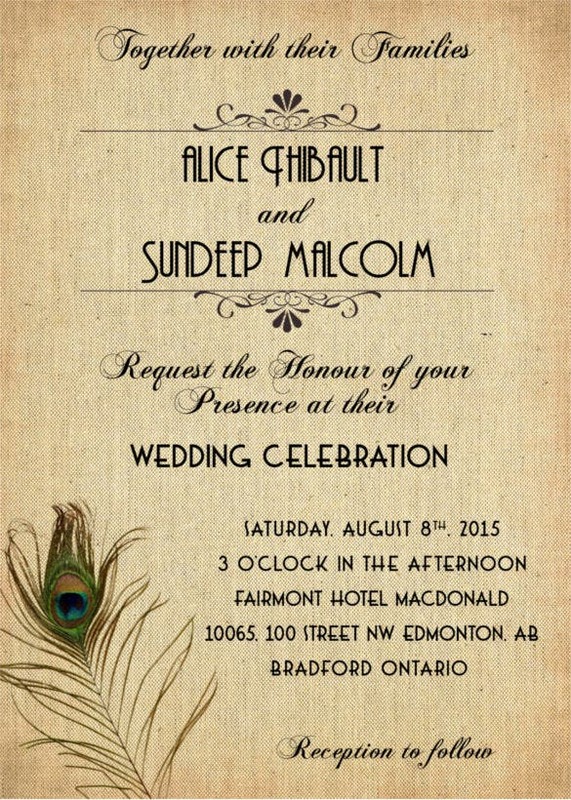 Use this template as your wedding invitation card and arrest the attention of all your invitees. 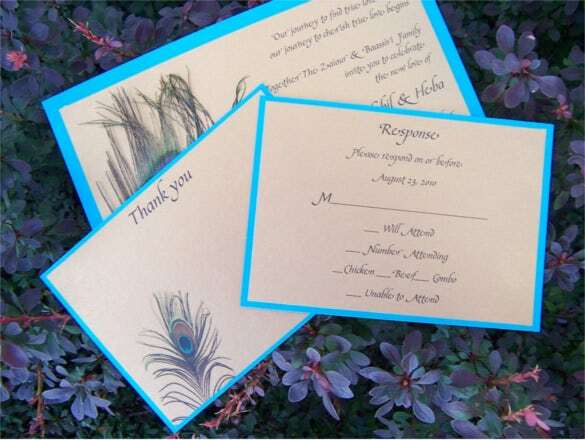 Wedding rehearsals are quite a thing and as much as the wedding needs an invitation, so does the rehearsal. 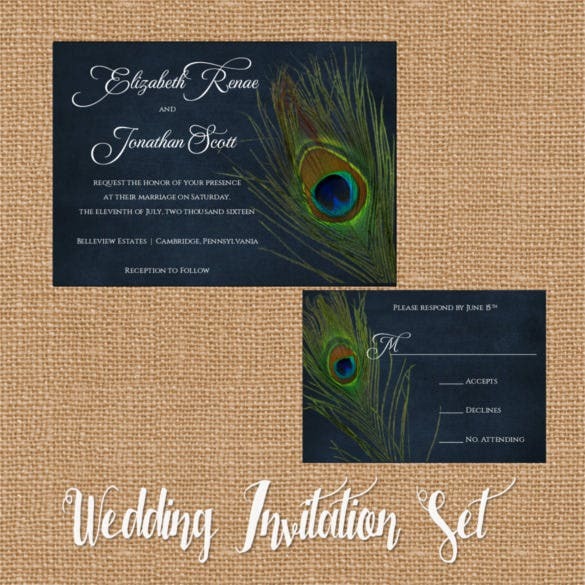 Invite your chosen ones for the rehearsal of the wedding in a stylish manner using this peacock feather rehearsal wedding invitation. 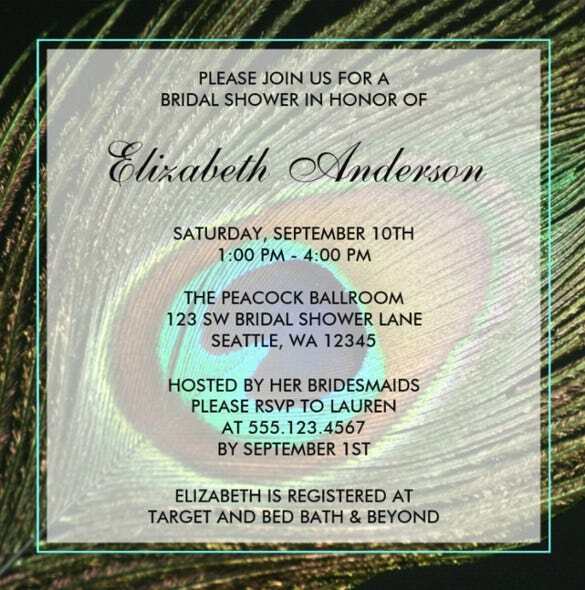 With this bridal shower feather peacock invitation, ask your friends and family to grace your bridal shower and enjoy the merriment as well as to bless you.